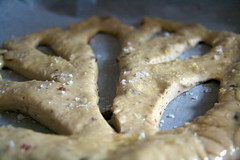 What have I been cooking this week? Well. After a few weeks of cooking nothing at all and eating rubbish, this week I’ve cooked loads – but not necessarily eaten terribly well. 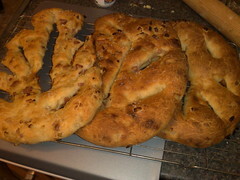 For Pudding Club on Tuesday, I made celery and stilton soup, rillettes de porc, and onion and bacon fougasse. Celery and stilton soup as per this Gordon Ramsey recipe, pretty much as writ. Ended up rather stringy, and apparently the way to avoid this is to take a potato peeler to the ridgey side of the celery sticks before you chop them up. Twenty years ago, when my despairing parents were trying to get us to eat more vegetables, celery made its appearance for the first time in our household, finely chopped, in casseroles. We were deeply suspicious – and they wouldn’t tell us what it was. It went by the name “crinkle cut onions” for a quite a while. These days, I’m a big fan of celery, raw with cheese and grapes, with the leaves sticking out of a Bloody Mary, finely chopped in soffrito-based sauces and cooking, and of course in casseroles. 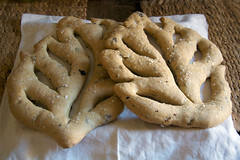 The rillettes de porc came from this recipe on Dried Basil and again was pretty much as per the recipe. Except… I used pork belly rashers rather than a single joint, as that was what was available. 500grams of pork rendered down to two ramekinsworth. Halfway through the cooking it looked scarily like all that water was never going to disappear, but all was fine by the end of the cooking. And it proved quite tricky to pour the melted fat from the baking dish to the serving dish without just getting it everywhere. This would make a fantastic dinner party starter, but a whole ramekinsworth is way too much for an individual serving, so I would have to find some way of presenting it in smaller portions if being fancy. 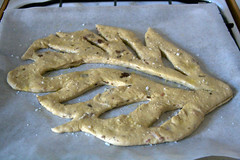 But it didn’t quite come out like that, and my version was more like the BBC Good Food version that I would have liked. 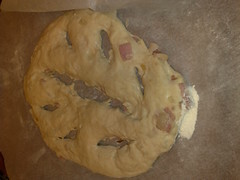 It was also more than halfway to pretzel – but tasted damn fine, if I do say so myself. So, that was Tuesday. Also this week, Kathryn’s post prompted me to make a carrot cake – I think the recipe is the same one, and can be found on the net here. Mostly per recipe, but I didn’t have the right nuts so used mixed chopped; and discovered very late in that I have run out of sultanas, so substituted candied peel, which I did have. I think this was also my second use of my food processor’s grating attachment. I remember it as being hugely wasteful, but it got through the three carrots in the blink of an eye and did a really good job, with only a small amount of the tail end of the carrot ungrated. http://rcm-uk.amazon.co.uk/e/cm?lt1=_blank&bc1=000000&IS2=1&bg1=FFFFFF&fc1=000000&lc1=0000FF&t=nileshomepag&o=2&p=8&l=as1&m=amazon&f=ifr&md=0M5A6TN3AXP2JHJBWT02&asins=B002BC9YGQ And rewatching 30 Rock last week sent me googling to try and find out what a “snickerdoodle” is – at one point Liz Lemon is being nice to her team and they start expecting her to bake snickerdoodles for them. 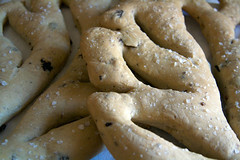 Turns out they are pretty simple but tasty biscuits. I found a recipe on Joy of Baking. By the time it came to make them, I was running low on eggs, so I halved the recipe. That still came out with well over two dozen finished biscuits, which is more than enough for us. Chatting about 30 Rock on Tuesday was enough to finally convince P he would like to try and watch it, so a box set has been procured to take with us on honeymoon. I have no objection to watching it yet again! 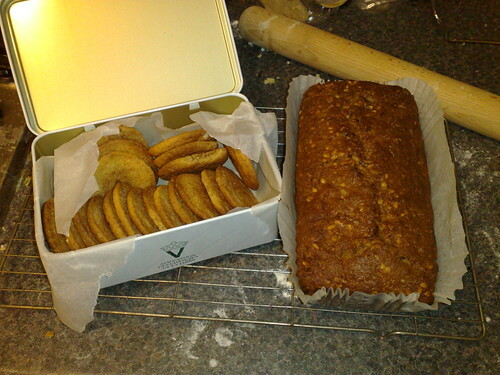 This entry was posted in Food, Ramblings and tagged pudding club. Well done! Some pretty tasty neologisms goin’ on there too. Is a ramekinsworth a particularly officious pastry chef? Eh? I thought it was a suburb of Rickmansworth. 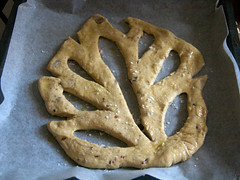 Fougasse looks great (love those posh pics you found, but they look like you’d need some practice for sure!) I’ve book-marked the recipe, ta.